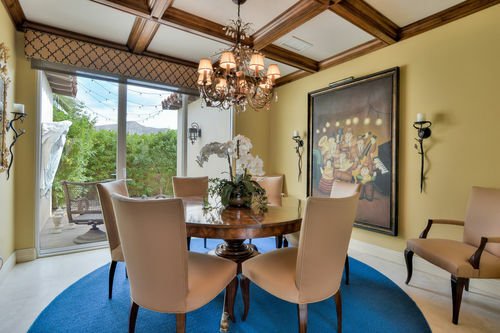 Welcome to "Vista Serena". 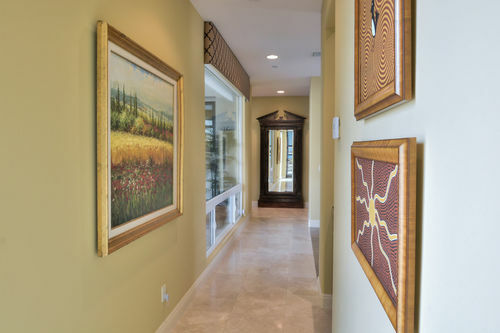 The home that brings serene views and tranquility on land that you own!. 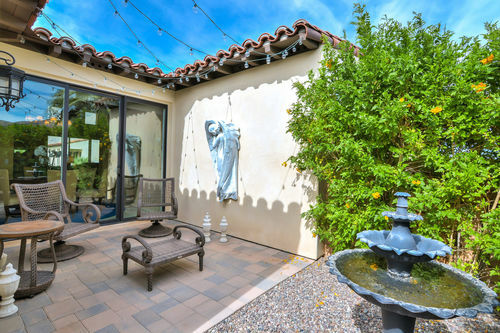 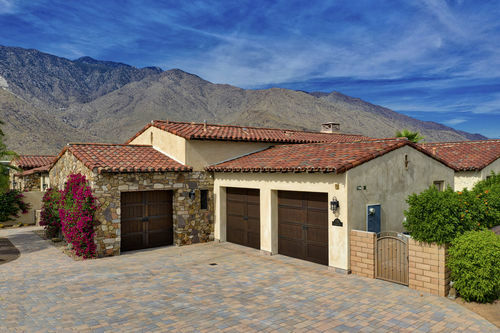 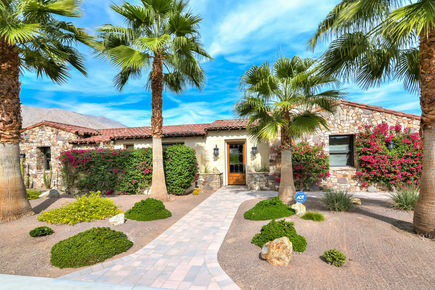 Revel in the luxury of Palm Springs living in this four bedroom, three and one half bath home in the gated Estancias at South Canyon community on land that you own. 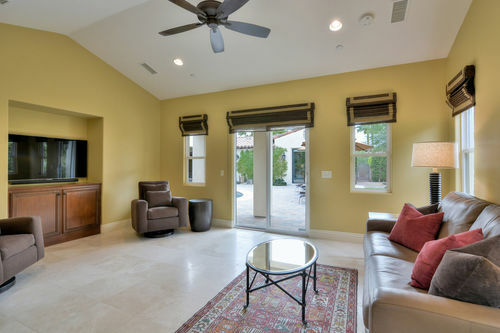 Recently buffed travertine flooring runs throughout an “L” shaped floor plan complimenting large windows for plenty of natural light. 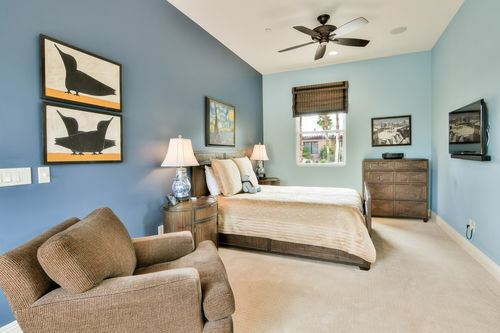 as well as, new carpet in bedrooms. 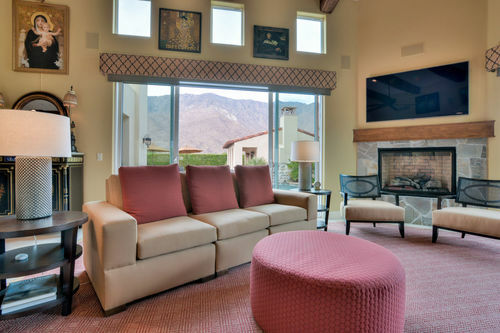 The great room offers high open beam vaulted ceilings and a cozy fireplace. 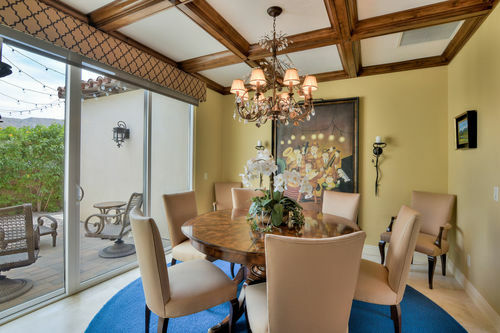 There is a coffered ceiling dining room lit with a stunning chandelier and private outdoor sitting area with mountian views. 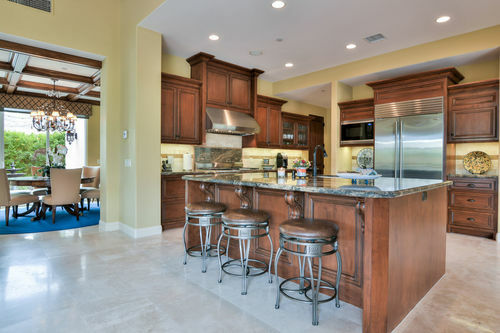 The gourmet kitchen comes equipped with high-grade appliances, Alder cabinets and a large granite central island with a breakfast bar. 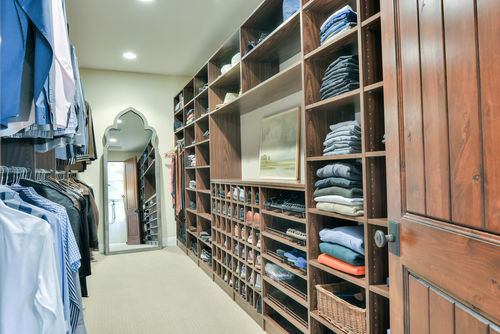 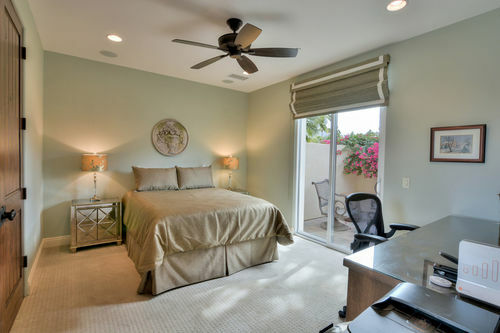 The master bedroom contains a spacious walk- in closet and opens to a massive bathroom with a glass shower, relaxing tub and dual sink vanity. 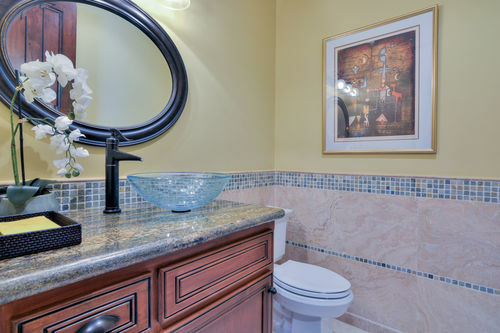 An detached Casita with bathroom is ideal for guests and provides extra space for recreational use. 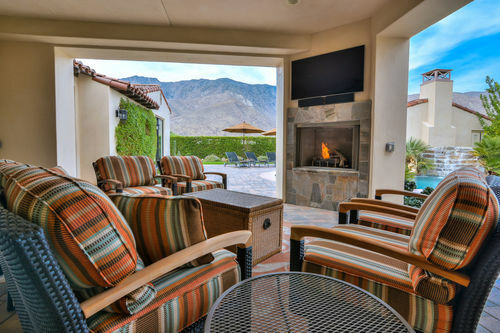 Each room offers a television and speakers, as well as patio seating areas and views of the mountains beyond. 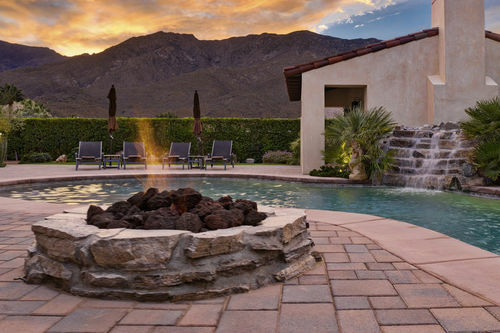 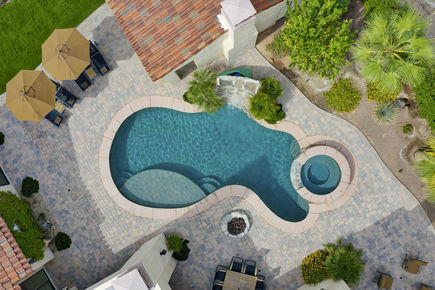 The luxurious backyard offers sparkling salt water pool with a spa and serene waterfall. 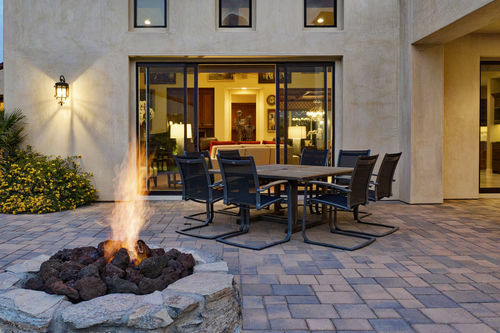 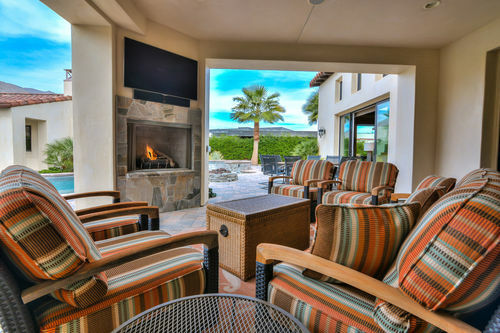 An extravagant covered patio is ideal for outdoor entertainment and dining with ample seating, a cozy fireplace, TV, and a fire pit, as well as, ability to add an outdoor kitchen. 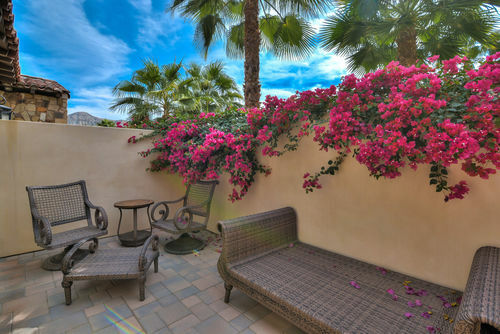 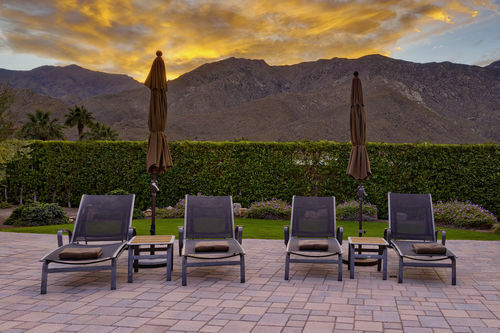 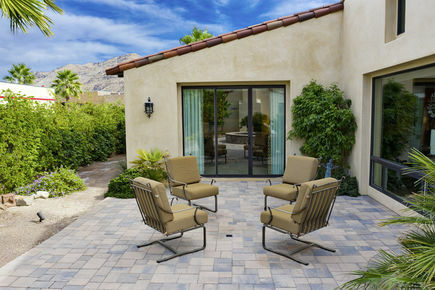 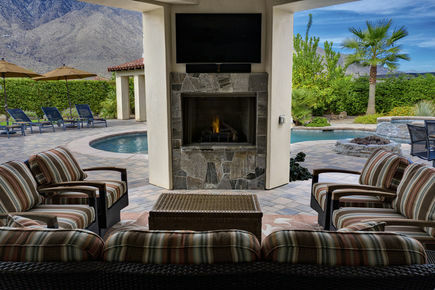 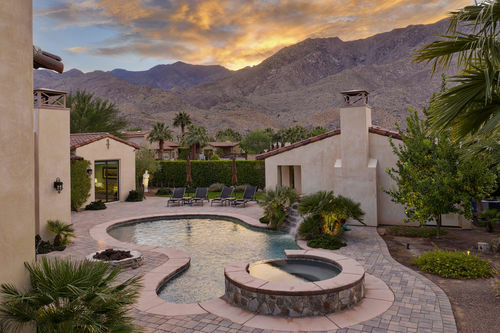 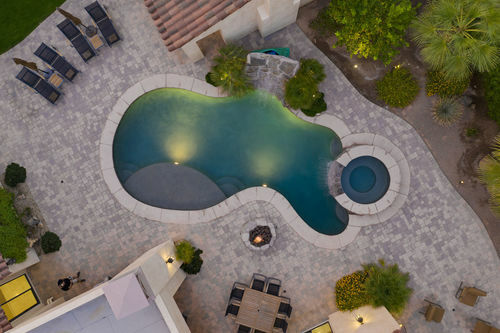 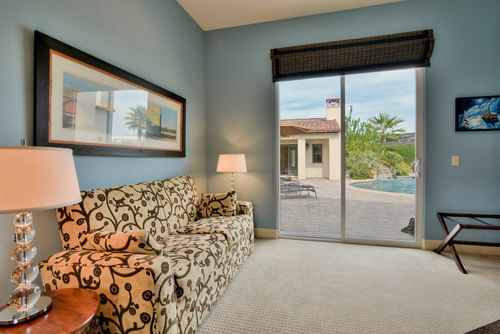 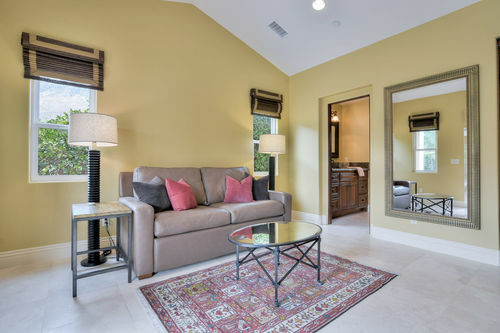 With approximately 3,513 square feet of livable space and beautiful landscaping, Vista Serena provides the peace and pleasure of the Palm Springs lifestyle that is close enough to the happenings of downtown, yet far enough away for the tranquil life you desire. 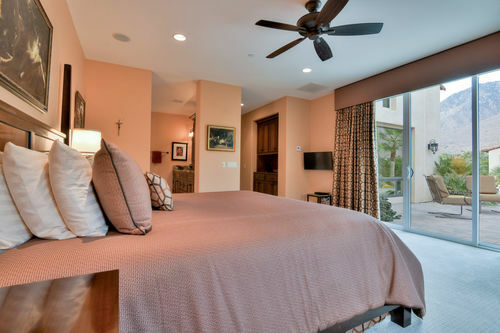 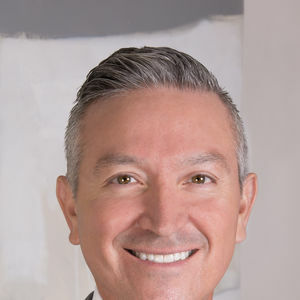 As a note: the current owner placed extensive thought into the interior paint colors to match the essence of the desert and the lighting of the sun to soothe the living experience. 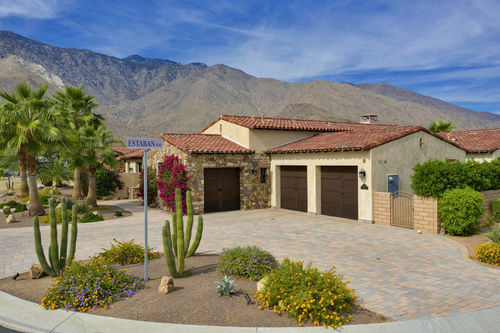 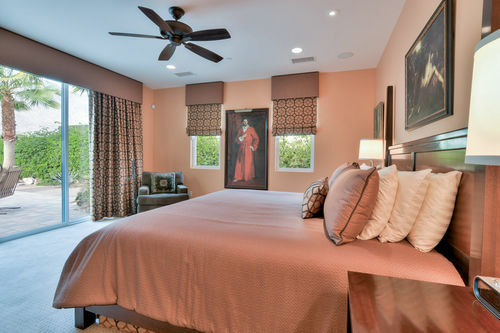 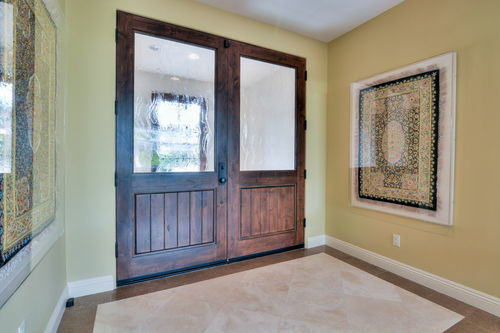 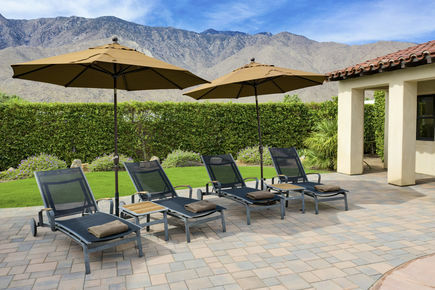 Estancias at South Canyon is a gated community with low HOA dues of $150 per month. 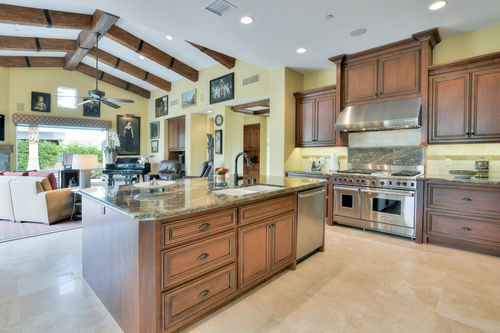 This Beautiful Sprawling 3500 Sq Ft Home sits on Approx. 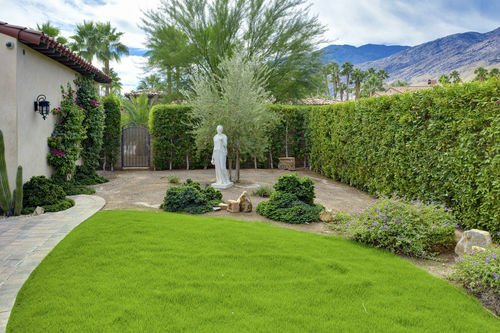 1/2 Acre on Fee Simple Land. 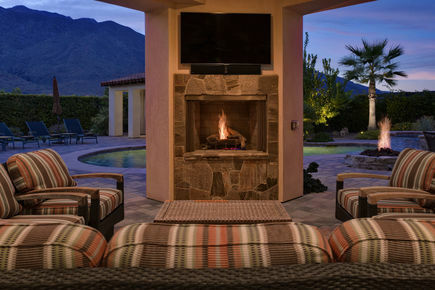 Located In Andres Canyon, Unbelievable views of the Sacred Indians Canyons and Mountains. 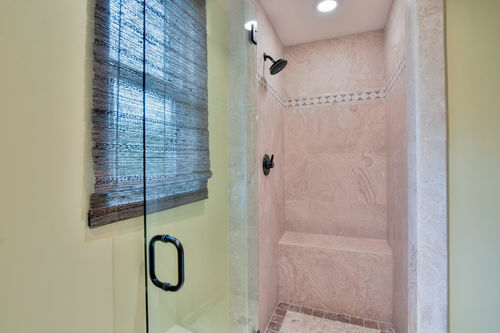 Home has 3 bedrooms and all have there own full Bathroom. 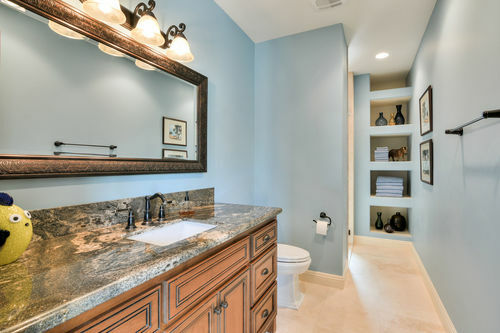 Half Bath near kitchen. 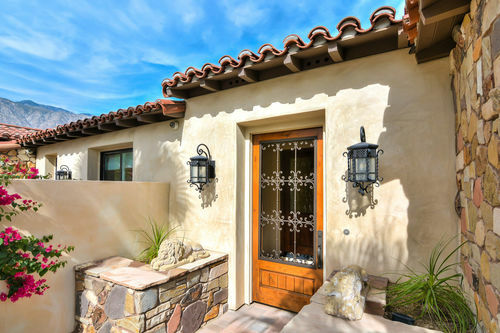 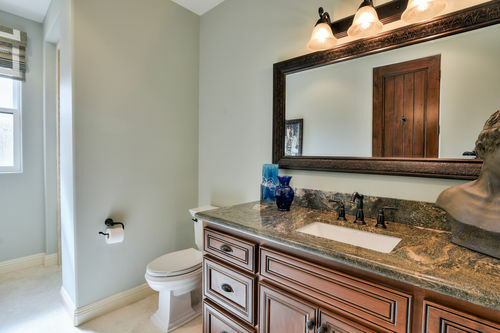 Home includes a detached Casitas with bathroom. 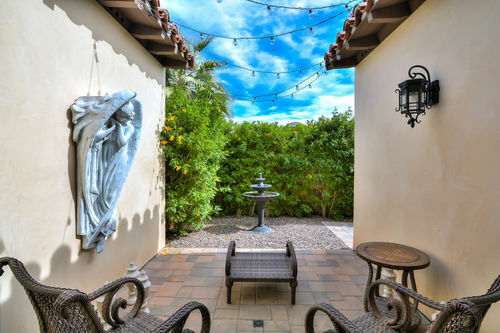 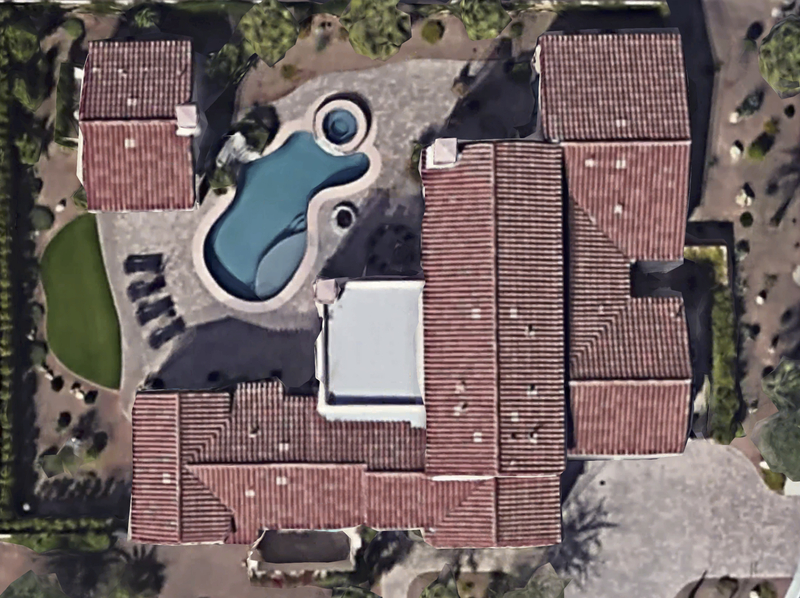 Home to include clay tile roof, troweled smooth wall stucco, pool and spa, Nottie Alder cabinets through out house, with soft touch hinges and glides. 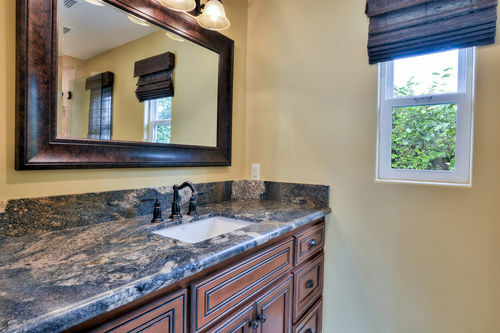 Mud Set Stone Kitchen Lighting. 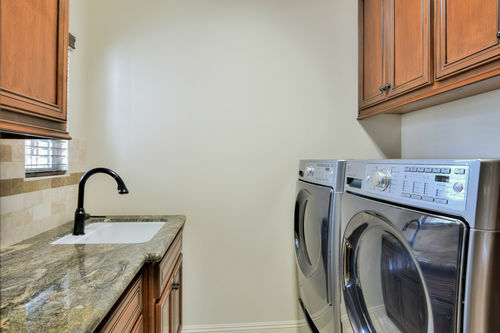 Hansgrohe fixtures, Viking appliances, 16.5 Ceer 2 stage Briant central AC system.